Start your yacht charter holiday from the marina at Antibes, close to the beautiful Iles d’Hyere, preserved as a marine park. Sail east or west along this unspoilt part of the French riviera where the sheltered coastline makes a great sailing holiday with beautiful beaches, plenty of anchorages and the famous resorts of St. Tropez and Port Grimaud. daily flights to Toulon and flexible yacht charter france durations make antibes ideal for a long weekend breaks in yacht charter France . St. Tropez has to be one of the great places to start a luxury yacht charter in france. Ringed by a centuries-old wall, small, intimate restaurants line the harbor, specializing in seafood and Provencale cuisine. Behind the waterfront restaurants you’ll find a maze of little streets and alleys (Â‘chemins’) with countless little shops selling everything from traditional Provencale foods and brightly colored linens to designer gear and hand-made one-off accessories. These three islands, also known as Iles d’Or (Islands of Gold) due to the yellow colour of their rock, provide a special contrast to the rest of the Riviera. Just a short cruise away from St. Tropez, each has its own distinct characteristics. Poquerolles, the largest of the islands has an excellent selection of lovely sandy (and often uninhabited) beaches, as well as a truly colonial feel to its villages, especially the main village of the same name. 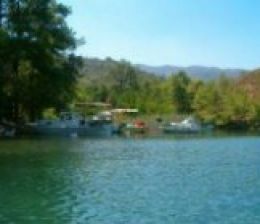 The smallest island, Port-Cros, is a National Park. The island has a wild feel to it and is a great place to hike and picnic. has its own charm: a covered market selling local produce and flowers. 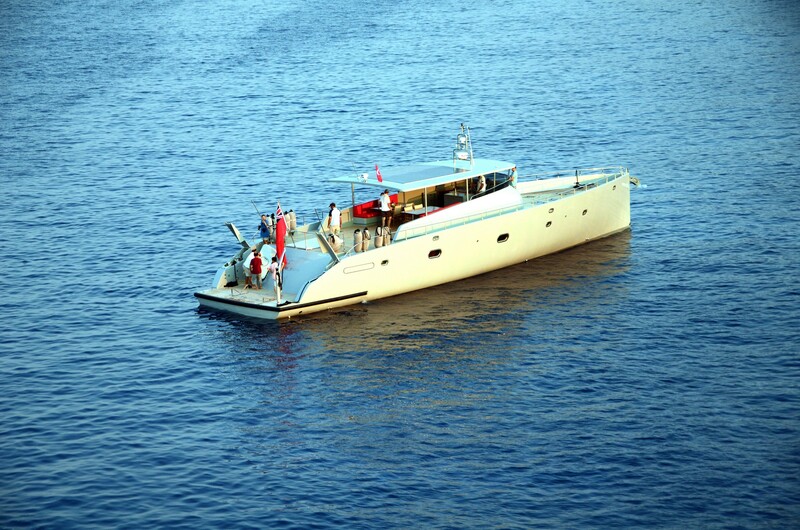 A must to include on your yacht charter france vacation. Just a short ferry or yacht tender ride from the old port of Cannes, St. Honorat and Ste. Marguerite are a breath of fresh air. The old abbey on St. Honorat, which is still a functioning monastery for Cistercian monks, has laid a blanket of calm over the island. Both islands are criss-crossed with walking trails which are so gentle they’re perfect for the least active of visitors. It’s worth going just to check out the abbey. Fort Royale (built in 1712) on Ste. Marguerite was, for a time, home to The Man In The Iron Mask – it’s a short walk from the port and makes for an engrossing trip. Take a picnic up to the fort – have lunch looking out over the bay to Cannes. Take your camera! 25 km of coastline where pebble beaches give way to fine sandy beaches (public and private), secluded even secret creeks and 5 ports (Vauban, Galice, Crouton, Olivette Antibes old town will be one of your favorite places. the Picasso museum and the Marche Provencal in front of the Mairie (town hall). Nice has so many faces, but has long been acknowledged “Queen of the Riviera”: with good reason. The famous Promenade des Anglais walkway skims the beach for a good couple of miles, and is always busy with tourists, locals, rollerbladers, skateboarders, joggers – you name it, it’s on the Promenade des Anglais. On the westernmost end of the Promenade des Anglais is the old town, between Place Massena and the Chateau. Take a break from the boutiques and galleries at on of the many bistros with a cafÃ© au lait at a table on the street and watch the world go by. Your charter yacht will likely berth near the old town. Villefranche de Mer and St. Jean Cap Ferrat, two idyllic seaside villages hiding superb restaurants, secret bays and excellent anchorages. Short inland trips arranged from your charter yacht can include ancient hilltop towns complete with picturesque passageways and countless galleries. Many yachts anchor off either harbour and guests use the yacht tender to shore. This quiet little town is becoming really popular with celebrities snapping up holiday homes on the Riviera, and with good reason. With a 16th century citadel and church and a beautiful beach, Villefranche is situated right between Cannes and Monaco. Stretch out on the beach or walk around the town. A walk up to the Musee Volti in the lovely old Citadelle (fort), or the nearby Musee Goetz-Boumeester, will make a few hours flash by. Visit the cool, serene Chapelle St-Pierre or soak the Citadelle St. Elme, home to three museums. Don’t forget a trip up to the tiny medieval village of Eze. The famous Monaco harbor, always lined with megayachts, is surprisingly small and the foothills of the Alpes Maritimes just tower over Monaco. The harbour is lined with instantly recognizable landmarks: on the one side, the Hotel L’Hermitage; on the other, the Royal Palace and beautiful old town, not to mention the Casino Royale. For raw, unadulterated glamour, this is the place. For shopping, there are countless shops in the twisty streets behind the port and in the old town. Cannes is one of the most famous resort areas in the world and International Yacht Charter Group’s specialists have access to every fully crewed charter yacht available in the South of France. Cannes, an elegant city known around the globe, home of the Cannes film festival and some of the finest stores in the world. The arts thrive in Cannes with the annual film festival and presentation of the Palm d’Or. Sandy beaches and stunning yacht after yacht dot the coastline here. A private crewed yacht charter in Cannes can be planned alongside year long festivals and events to cruise the coast of the south of France. While in Cannes, a yacht charter france can let yourself choose the time and place of your arrival plus length of your stay in Cannes. All along the waterfront runs the legendary la Croisette. This is where millions of people watch the glittering celebrity turnout for the Cannes film festival every year, and where those with A-list taste can indulge at the couture fashion houses tucked between the luxury hotels, such as Chanel and Christian Dior. Lining the beach are dozens of restaurants which also rent sun loungers, some of which morph into funky nightclubs when the sun goes down. For shopaholics, rue d’Antibes runs parallel to la Croisette and is crammed with everything from typical French high street fashion to designer shops. The Old Town of Cannes has its own charm: a covered market selling local produce and flowers, the produce is not cheap but is incredible quality, but the flowers are a bargain, especially the roses. For those long summer evenings, go for dinner in the Old town. Walk up the cobbled rue Le Suquet and rue Petit Antoine where little intimate restaurants abound. Near Cannes lies a group of small islands called the Iles de Lerins. Just a short distance from the old port of Cannes, St. Honorat and Ste. Marguerite are a breath of fresh air. The old abbey on St. Honorat, first established in 400 a.d. and rebuilt in the 18th century, has laid a blanket of calm over the island. Both of the islands are criss-crossed with walking trails which are so gentle they are perfect for the least active of visitors. It is worth going just to check out the abbey, which is still a functioning monastery for Cistercian monks and also provides accommodation for anyone who wants to stay a little longer. Ste. Marguerite has far more colorful history than her brother island; Fort Royale (built in 1712) was, for a time, home to The Man In The Iron Mask, before he was shipped off to the Bastille where he spent his remaining years. Fort Royale has been used as barracks over the centuries and you can see the updates. 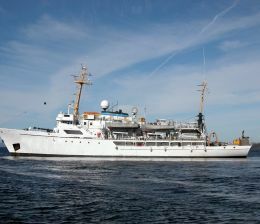 It is a short walk from the port and makes for an engrossing trip. Luxury yacht charter specialists, we are experts in matching our customers with a yacht charter that meets all of their unique needs. 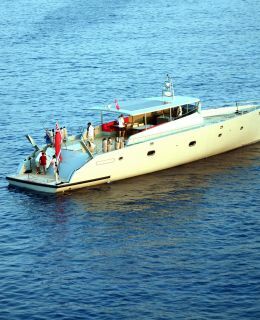 A yacht charter is an ideal way to see the French Riviera. With our expert assistance, we can place you on a yacht charter that will have you enjoying the South of France in a state of ultra-luxury, Sailing Yachts, Motor Yachts and Mega yachts are all available and we have access to every fully crewed luxury yacht cruising the French Riviera each summer. France has three different climates. The west part is oceanic with mild winters and mild summers. Temperatures vary between + 5° and + 21°C on average. The east part is continental with cold winters and hot summers. Temperatures vary between 0° and +25°C on average. The south-east part is Mediterranean with mild winters and hot summers. Temperatures vary between + 5° and + 25°C on average. France is an easy destination to reach. Paris CDG hub has direct flights from all over the world welcoming 74 million passengers a year. Nice on the French Riviera also has an important international airport. The Eurostar links Paris to London within 2h30 and the Thalys train links Paris to Brussels within 1h20. Motorways and freeways make it very easy to drive around France. The density of our road network is such that there are few traffic jams and that driving is safe and timely. In France, you can find within a relatively small country, all types of landscapes. If you are looking for mountains and ski resorts, there are among the best in the world in the Alps (Chamonix and Courchevel), but also many in the lower mountains of the Pyrenees and the Jura regions. The coastline is renowned throughout the world with the French Riviera and mythical towns such as Cannes, Nice or Monaco, but also St. Tropez and other beautiful Provence villages along the Mediterranean sea. Other resorts are also highly recommended on the more vivid Atlantic ocean with Biarritz, Arcachon, La Baule and many others. The countryside is a compromise between nature and man-made mosaics of fields which give such a reputation to regions like the Dordogne valley, Normandy, Burgundy or Provence where forests and agricultural lands blend together showing the most beautiful landscapes in the world with postcard villages nestled within the cities are also very much visited for their architecture and historical monuments, as well as for their market places, festivals and other social events. Culture & art date from the paintings in prehistoric caverns to futuristic contemporary art, France has been part of, and initiated, many artistic and architectural movements. Literature, cinema, music, sculpture and even comic strips, we have always been interested in every segment of art. The number of works that the past generations have left behind is among the richest cultural heritage in the world. Impressive collections of art are scattered throughout numerous museums and chateaux and great monuments are present all over the country. The french Chefs are a country pride and the wines are the most elaborated. France export know-how throughout the world. France’s history is one of invasions, occupation, colonisation, wars won and lost all over the world and has influenced many other nations. Today France still has territories in every ocean of the world, souvenirs of its past and remains one of the politically influential countries of the world. Whether your choice goes for classical or modern hotels, boutique or large hotels with conference facilities, France offers a large range to fit every need and taste. Whatever the type of group you have, there is always the hotel they are looking for. Hotels are constantly being renovated and kept to the highest international level and the choice grows constantly with new hotels opening all over the country on a regular basis, especially on the 4-star level. It is important to note that the 5-star category does not exist for French hotels and is replaced by the 4-star deluxe category. French service is renowned for its efficiency. In restaurants or with caterers, the Maitre D, the sommelier and the waiter all know exactly what to do and how to do it with a maximum of discretion, and are always there when you need them. Service is part of the French art of the table. Today, most persons working in the tourism industry speak English and / or other foreign languages. France has concentrated the know-how on all luxury goods and many of the most renowned brands originate from this country. Christian Dior, Louis Vuitton, Baccarat, Hermès, Boucheron, Chanel to name but a few… they’re all in Paris, which is the world capital for fashion and luxury goods, and waiting for your visit to make you discover the most elaborate goods their craft can create. 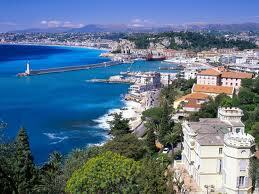 Paris and the French Riviera are among the top world destinations for meetings and congresses. Easy access, a large choice of hotels and congress centres explain this. For a board meeting or a congress for 5 000 persons, you can organize your meeting in a pleasant setting with the latest technology for all your requirements. Soccer, rugby, tennis, formula 1 and horse-racing offer major sport events happening every year in France and broadcasted throughout the world. Ski races, golf tournaments, sailing events are also programmed regularly. French people enjoy many sports and are always on the lists to host major international events with the necessary sport infrastructures to support them. Over one million foreigner have already bought a holiday home in France. The French way of life is often the main reason for this purchase. Enjoying the small moments of life and taking time to live social events thoroughly is a tradition that has been preserved in a world that is going faster every day. Shopping in street markets, having a drink on the terrace of a café, taking time for lunch or lazing in the sun are typical of French lifestyle. Security is a major criteria when choosing a destination, particularly for corporate clients who do not want to take any risk with their staff or guests. France comes out as a very safe destination with no major risk to fear. The French who regularly enjoy demonstrating in the streets and criticising their government however they are not an aggressive nation.